In 1645, Dutch farmers bought the north shore of Queens (the area now called Whitestone) from the Matinecock Indians for one ax for every 50 acres. The most famous forefather/resident of the area was Francis Lewis, a merchant who retired to Whitestone with a considerable fortune a decade before the Revolutionary War broke out. On August 2, 1776, at age 63 he signed the declaration of Independence as New York State's representative. For that and his earlier rebel activities he paid a heavy price. A month later his house was destroyed and his wife was captured by the British. The pneumonia she contracted as a prisoner hastened her death in 1779. He was one of the American patriots to sign The Declaration of Independence. Francis Lewis Boulevard and Francis Lewis Park are named in his honor. The area was incorporated as part of New York City in 1898. 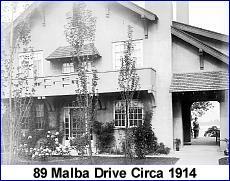 Malba and Beechhurst were not developed until the turn of the century. Malba, "on the sound", became the most affluent section, settled by prominent businessmen and professionals. In the 20's Beechurst became a playground for the Broadway set, who were attracted by the easy access of the LIRR and the feeling of escape afforded by the river. Today, Malba located at the foot of the Whitestone Bridge and 10 miles from midtown Manhattan, is a small residential enclave of 400 homes with manicured lawns and a mix of nationalities. This quiet, green oasis is unique. Malba borders Francis Lewis Park , the 17 acre river-front , where fishing is still permitted under the Bronx-Whitestone Bridge. 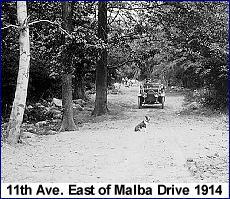 The name MALBA was derived from the first letter of the surnames of the five men who developed the old Van Nostrand farm (today's North Drive) in 1908: George Maycock, Samuel Avis, George Lewis, Nobel Bishop and David Alling. These far-sighted men projected a system of restrictions as to the character and use of the land and the size and locations of properties. They reserved title to the streets and to the entire waterfront as a protective reservation designed to preserve the unified character of the community. The original twenty seven houses were priced from $19,500 to $30,000 and landscaped by the renowned Lewis & Valentine Landscape Architects. Malba became New York's most desirable all year suburb. One real estate advertising article had this to say: "The day of the big Country Estate is past. The lure of the country is stronger than ever, but the overhead expense of acreage combined with the overhead of the winter home in the city, has resulted in a practical combining of the two homes by an all year home in the nearby suburbs, where country comfort may still be enjoyed amidst an atmosphere of contentment. Homes within a half-hour of the city offers practically every convenience of the city house. It is due to this condition, together with its own natural beauty of Woodland and Waterfront combined, and its excellent transportation conveniences that the North Shore of Long Island has become the most desirable home district of New York City, for people who desire a home of the better type, expressive of their own individuality and prestige." The original draw for home buyers in the early part of the century, as it is today, was Malba's exceptional location and strong appeal to country life for those desiring a community with a combination of woodland and waterfront living. It also offered its own private bathing beach, boat landing and pier, a golf course, tennis courts and children's play grounds. 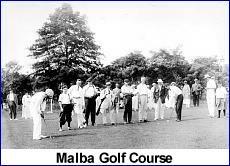 Malba residents could boast about their Polo and Riding Club, the Garden Club, The Field and Marine Club and the Woman's Club. Its proximity to the College Point-Bronx ferry and the Malba station of the Long Island Rail Road to Penn Station provided commuting ease. For more than twenty-five years Malba enjoyed exclusive use of a private coach service which connected the community with the subway, railroad, bus facilities, schools and the shopping center in Flushing. It was run on a subscription basis. In 1961 an attempt was made to establish a community clubhouse which would operate and maintain a swimming pool, tennis court, ice skating rink and gymnasium. The necessary capital expenses were to be raised by issuing bonds. The project never materialized. For many years the entrance to Malba was adorned by a fieldstone gate which proudly proclaimed the name of our community for all to see. With the coming of the World's Fair and the widening of the Whitestone Expressway, the property upon which our gate was erected became part of the service road. In 1964, the Malba board of directors arranged with the contractor who built the parkway to have the gate placed on a new plot when the road construction was completed. However, in moving the arch to its new location, it was inadvertently dropped and damaged beyond repair. Today, even without the gate, Malba is a symbol of greatness and charm. It continues to be populated by residents who are proud of their homes and their community. The equipment of the children's playroom at Gimbel's Dept. Store was purchased by Malba Estates Corp. and used for a Malba children's park. Ferry Service once ran from College Point to the Bronx.